For dinner last night I made up a small pot of creamy soup. It went nice with some warmed up garlic breadsticks on a cold evening. Melt butter in a heavy medium sauce pan over mdium heat. Cook the vegetabes for about 15 minutes or till just getting tender. If they start to brown turn the heat down. Whisk in the flour and cook for a minute. Slowly whisk in the water with bouillon powder, then add the milk in. Drain the canned chicken broth into the soup, reserving the chicken. Add in the Worcestershire sauce, parsley and lots of pepper. Cook until thickened, whisking often. Add in the chicken, crumbling with your fingers. Whisk in, then add in the cheese. Turn the heat off and stir till melted. Serve up and top with a bit more cheese and chives to taste. Wow…sounds yummy! 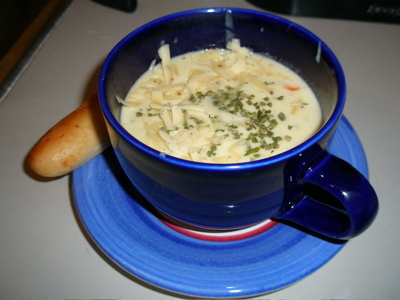 I love cheesy soups; they are filling enough to be a meal in themselves. This is Hannah with Tillamook Cheese public relations. I wanted to let you know that we chose your recipe as our post of the day for our new Fan Club Web site.